Shock resistant malleable iron casting is newly designed to cut dead weight without impairing strength. Tool steel blades are retained within the housing at moment of impact for safe operation. Blades are “U” shaped to help rope keep its original shape. IC1 — Cuts 3/4 in. wire rope continuous service or 1 in. wire rope intermittent service. IC2 — Cuts 1-1/16 in. wire rope. Three 1/2 in. bolt holes on 5.30 in. diameter circle. 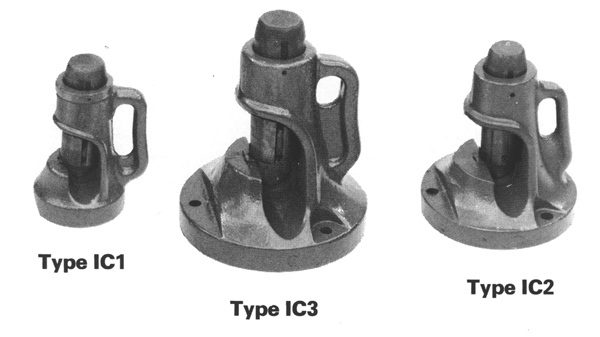 IC3 — Cuts 1-1/2 in. wire rope. Three 1/2 in. bolt holes on 6.74 in. diameter circle. Government Spec. Numbers: GGG 0800, Type 111, Stock #5110-293-1066. The self-contained hydraulic cable cutter is a precision engineered tool designed to give a clean cut with minimum effort. Just pump the handle… no outside power is required. This self-contained portable tool can be easily carried and is used by contractors, rigging lofts and elevator repairmen. All three models will operate underwater. 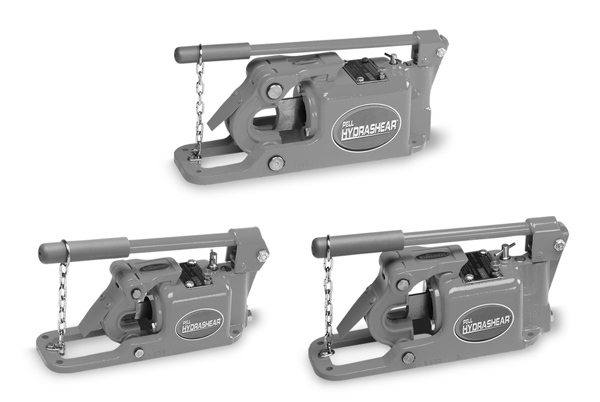 The Pell Hydrashear® is recommended by wire rope manufacturers and used by industries throughout the world. The blades and die sets are made of the finest tool steel available, heat treated and ground to close tolerances. This means a long life for the blades as well as superior performance. The hydraulic cutters are available in three sizes and capacities. The power operated cutters require an external hydraulic power source for operation. 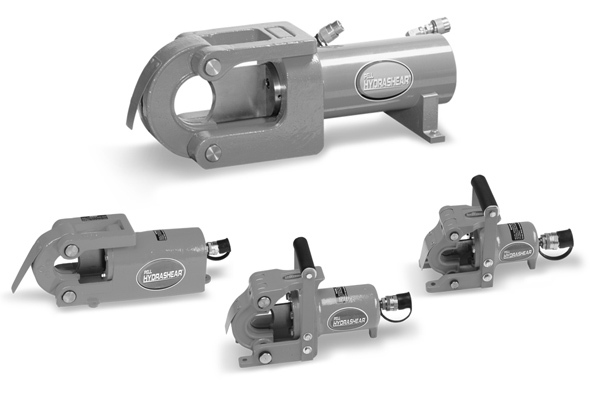 These models can be activated by any electric, gasoline, hand, battery or air operated hydraulic pump capable of developing 10,000 PSI and having free flow return through the pressure line. The pumps are hose-connected to the Hydrashear body. The power operated cutters are available in three sizes and cutting capacities. The Model PRE has a 1-1/8″ capacity, the Model CRE, a 1-3/4″ capacity and the Model MRE a 2-1/2″ capacity.